Rutland, VT – October 11, 2017. 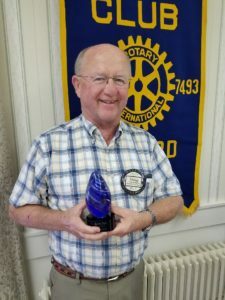 Pure Water for the World, Inc. (PWW) is honored to announce Doug Rupert, a Rotarian from the Milford (NH) Rotary Club, as the 2017 “Ripple Award” recipient, for his profound dedication to bringing sustainable safe water solutions to children and families living in the most underserved communities in Honduras and Haiti. While traveling on a service trip to Honduras with Rotary District 7870 several years ago, Rupert spent a few days working with the PWW team on a water project. He saw, firsthand, the life-changing benefits families were experiencing from having sustainable access to safe water. When he returned home to New Hampshire, he put his newfound passion into action, making the commitment to support the provision of safe water solutions to families in need. Rupert was instrumental in procuring a Rotary Foundation Global Grant to support children and families who live in Trojes, the rural region he initially visited. His commitment to helping this community resulted in $138,000 in grant funding, which has benefitted 425 families with life-changing safe water and sanitation solutions. Today, Rupert continues his steadfast efforts, pursuing additional funding to create an even greater impact. His work is currently focused on bringing safe water solutions to 850 families in Cité Soleil, Haiti, the poorest slum in the Western Hemisphere. The “Ripple Award” was initiated in 2014 in honor of the ripple effect; small actions can create a tremendous impact. Previous “Ripple Award” honorees include: The Hoehl Family Foundation, of Vermont, for its tremendous support with bringing safe water solutions to 1,000 families in the urban slum of Cité Soleil, Haiti; to Emma Owens, Ellie Hall, and Hannah Fisher, three Vermont high school students, for their initiative to raise funds to bring clean water filters to 1,070 underserved families in Haiti; to Ken and Ruth Grabeau, of Nashua, New Hampshire, and Peter and Marion Abell, of Brattleboro, Vermont, for their unwavering commitment to safe water for children and families and their unceasing support of Pure Water for the World since its inception. PWW honored Rupert with the 2017 “Ripple Award” in recognition of his dedication to using his volunteer trip experience as a platform to launch a ripple of change that has already spread wide enough to help hundreds of children and their families. Learn more about this work by visiting www.purewaterfortheworld.org. PWW Travelers, Uncategorized PressRelease, PWW Travelers, PWW Volunteers, Ripple Award. permalink.